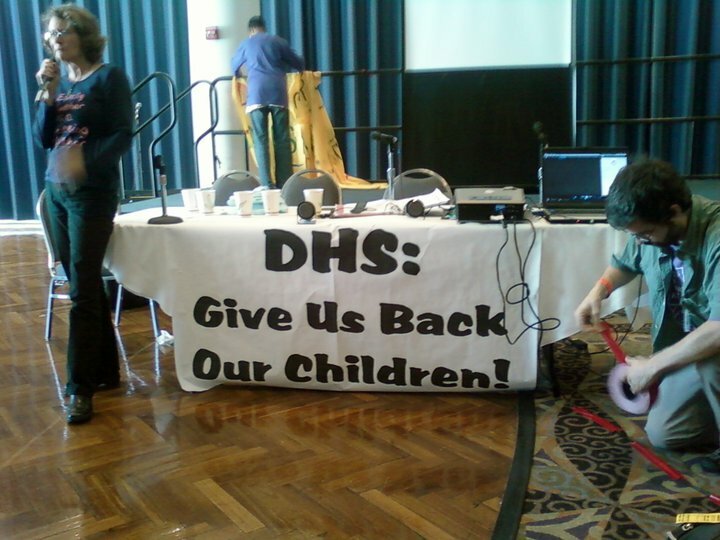 Luckily, the second USSF, held June 22-26 in Detroit, proved that adoption/child welfare activists and allies have been doing our work, and doing it well, because these issues have now made it on the radar screens of many participants I spoke to. And no one looked at me like I was attending the wrong conference when I told them about the workshop I was leading. Our session was titled “Where Have All Our Children Gone? 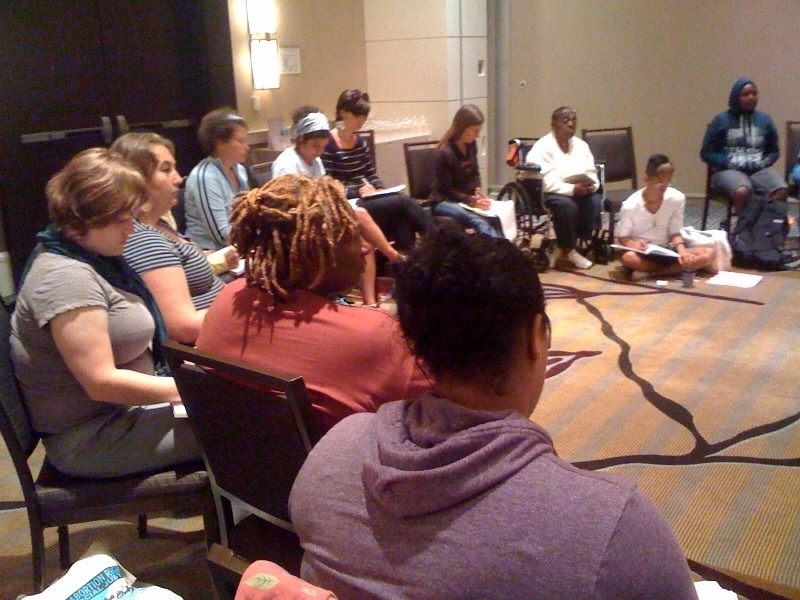 Linking Child Removal From Communities of Color to Larger Social Justice Issues,” and was facilitated by fellow members of Adopted & Fostered Adults of the African Diaspora (AFAAD) Connie Galambos Malloy and Ian Hagemann, and Sahngnoksoo (SNS) member Sunny Kim. But I think I am getting ahead of myself here. For one thing, you are probably wondering what the USSF is, exactly – unless you attended, had friends or colleagues who attended, or are otherwise involved in the activities of the American Left. As I said above, the first USSF was held in 2007, in Atlanta, and represented a major breakthrough in grassroots organizing in the U.S. 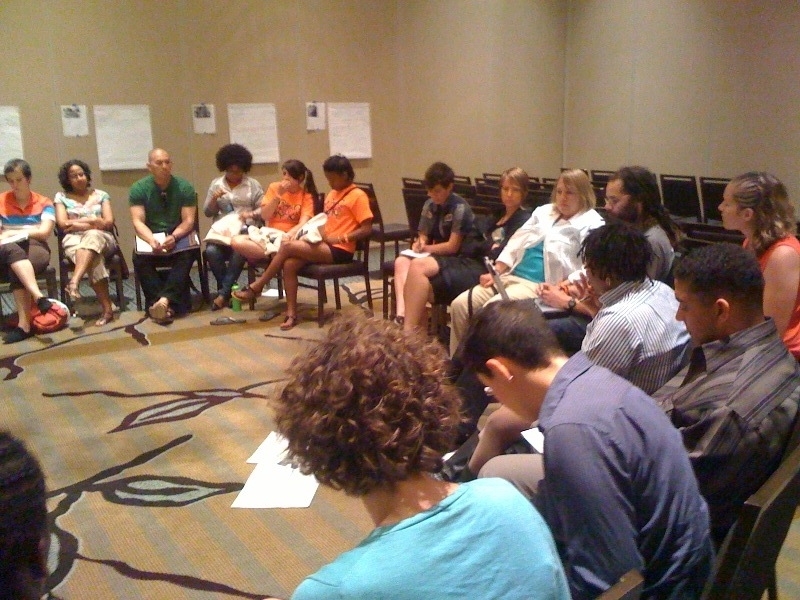 It was the first time such a large gathering of organizers and activists from the American Progressive Left came together under the guise of building a sustained movement for social change – and led by those most oppressed by neo-liberal economic policies (mainly lower-income, people of color). Over 12,000 people attended, which was amazing in itself, since many people thought that you could never get a Left as splintered as ours together to discuss the great justice issues of our time, coherently, and set an agenda of action, to boot. 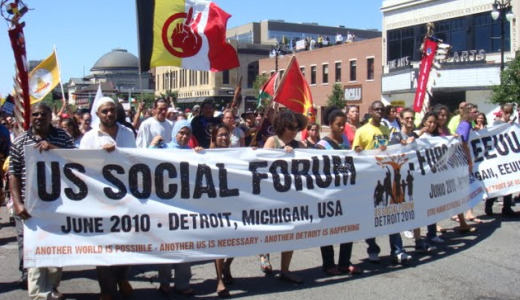 It was this initial event, strategically held in the American South, the cradle of the U.S. Civil Rights Movement, that laid the groundwork for the second forum in Detroit. 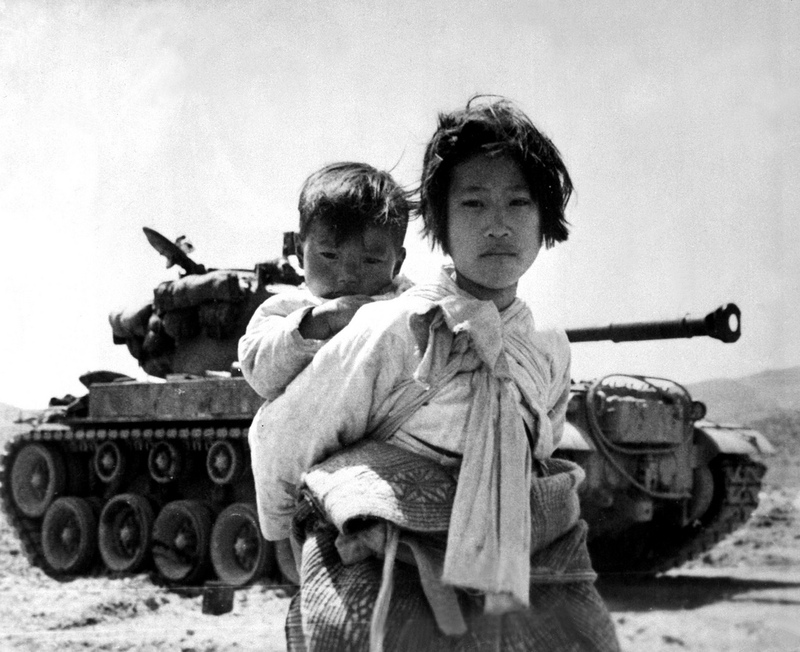 But the real roots of the USSF stretch way beyond our borders, to the Global South. 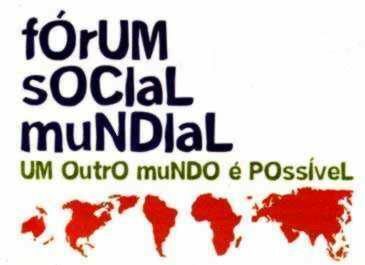 Indeed, the mechanism that initiated the USSF was the World Social Forum (WSF) . Selecting Detroit as the site of the 2010 USSF fit nicely into this vision. The city is a stark example of the shape of things to come if free-market capitalism is allowed to take precedence over community needs and relationships, and also exemplifies the kind of do-it-yourself, don’t-wait-for-someone-else-to-save-you ingenuity that is at the heart of the Forum philosophy. Detroit’s consistently high unemployment, White Flight, decaying infrastructure and urban core, and failing schools are all the result of neoliberalism gone wild in some way, while its flourishing urban garden movement, and dedicated organizing communities inspire those facing similar problems around the country. Hart Plaza, in downtown Detroit. As someone who grew up in Ann Arbor, a smallish university-town about 45 minutes west of Detroit, the USSF was an amazing opportunity for me to really experience Detroit for the first time. 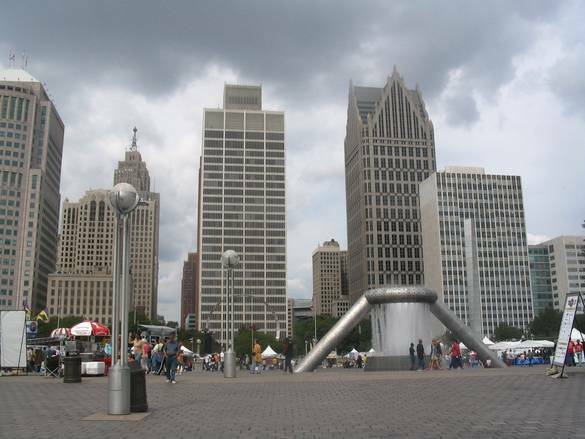 Sure, our family frequented the Montreux-Detroit Jazz Festival on Labor Day weekend every year when I was growing up, but Hart Plaza was just about as far in as I got. My perceptions of Detroit were largely formed by the media, and the middle-class friends and classmates I was surrounded with: Abandoned houses, corrupt politicians, rampant crime, and poverty. Detroit was seen as A VERY DANGEROUS PLACE in this context, some place to be avoided, and certainly not visited alone, or God-forbid, alone with a baby, as I did last week. And, to be fair, all of this is true in some way. Detroit has major problems that no one can reasonably deny. The issue is that this is only one reality, amongst many others. 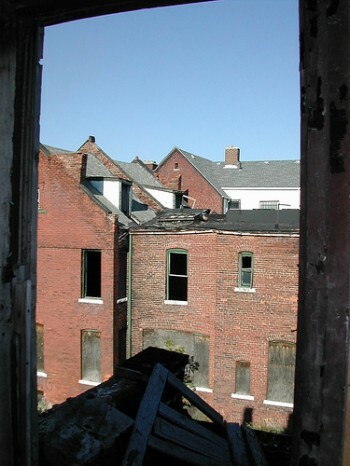 Abandoned buildings in Detroit. (Image by Luca & Vita via flickr). 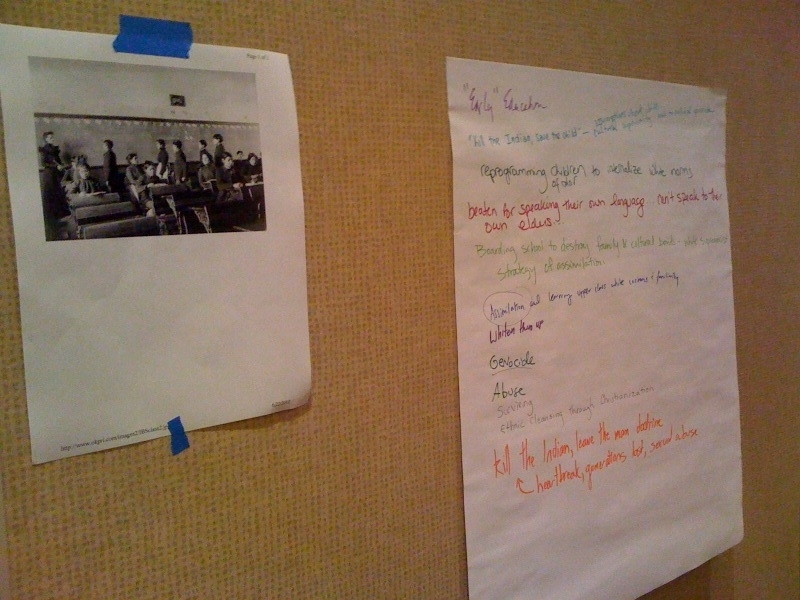 Workshop participants responded to various images of child removal from communities of color, placed around the room. Photo by Sunny Kim. The rest of the session was taken up by going through, and responding to, a Timeline of Child Removal From Communities of Color, headed up by Ian. I am not going to include sections of the timeline here, as it is still very much a work-in-progress. The timeline is a project that many scholars and adoptees of color have taken on recently, including Jae Ran Kim , Lisa Marie Rollins, and members of the Adoptees of Color Roundtable . AFAAD has an ongoing interest in creating a collaborative document – something that folks can contribute to online, through Open Source file sharing, not unlike Wikipedia. The issue is, as always, finding funding to do so. Please contact us if you have any leads on financial or human resources we could use to make this a reality, as seeing the sheer visual reality of child removal from communities of color forces us to grapple with how successful these policies have been, and then, hopefully, strategize on realistic interventions we can make in order to make families and communities less vulnerable. Sunny gave an excellent summary of Andrea Smith’s “Heteropatriarchy and the Three Pillars of White Supremacy,” in order to ground and contextualize the discussion during this activity, which was eminently helpful. I, myself, have been mired in the “oppression olympics” paradigm when attempting to organize or even discuss shared oppressions with other adoptees and people of color, so it is very helpful to have a framework to use that acknowledges the destructive and overwhelming power of white supremacy, while simultaneously acknowledging the very distinct ways that Native, Black, Latino, and Asian bodies are racialized in this country, based on our separate histories. 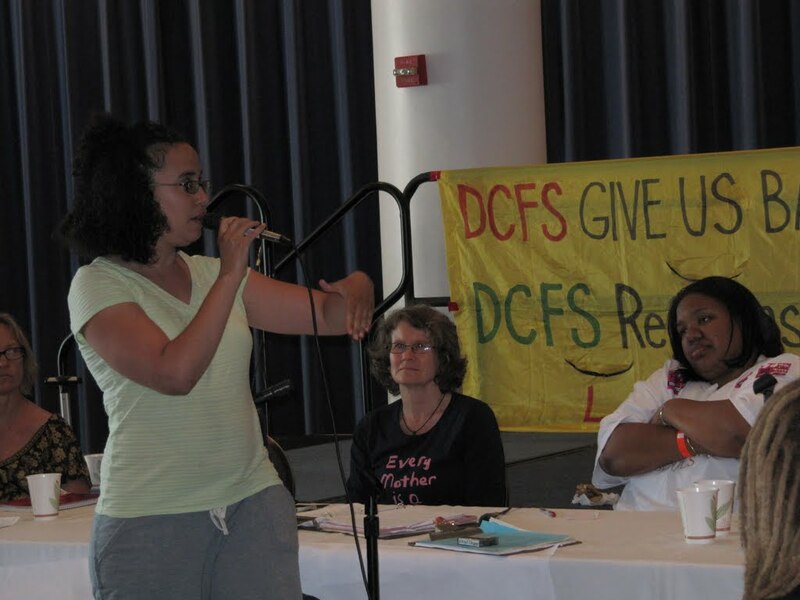 Me speaking at the open mic at the end of the "Poverty Is Not Neglect" workshop. Photo courtesy of Every Mother Is a Working Mother Network. 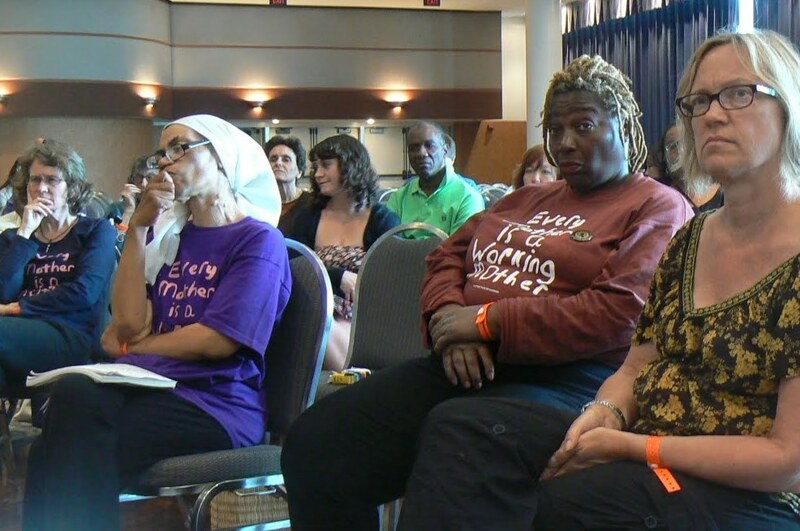 "Poverty Is Not Neglect" workshop attendees. Photo courtesy of Every Mother Is a Working Mother Network. The SB 1070 Protest in Cobo Hall, at the USSF. Photo by Melva L. Florance. Attending the USSF is a priority for me every three years, as I find that the older I get and the longer I fight various social justice battles, the more important it becomes for me to be inspired. Otherwise, I start to feel completely overwhelmed and cynical. My perspective on the history and reality of social movements – that they are usually a series of crushing defeats, followed by very small gains – starts to become completely unmanageable. Somehow, remembering that it is these gains, no matter their smallness, that alone have the capacity to redeem any semblance of our humanity, becomes next to impossible when I am mired in daily struggle. But being around thousands of activists, organizers, and everyday people, who like myself are just trying to live a self-reflective life that harms as few as possible, reminds me that I am not alone. I begin to believe again that perhaps I really can keep along this path, despite the difficulties and heartaches. I keep coming back to the response of my good friend and mentor Rose Brewer, when I asked how she keeps on going as such a committed and engaged activist, all these years, and in the face of monumental challenges. We were in the midst of the Opening March, slogans and bodies weaving in and out of the small space between and around us. “What other choice is there?” she replied evenly.